We’re just two days away from seeing the Atlanta Falcons and New England Patriots go head to head at Super Bowl 51 in Texas. With an anticipated viewership of over 100 million people, it’s no surprise that some of the world’s biggest brands are pulling out all the stops in an attempt to win a much anticipated off-field battle. We are of course talking about the annual Super Bowl ads battle, where top brands are willing to cough up over $5 million for just 30 seconds of TV airtime. Last year, we analyzed 1.8 million tweets during Super Bowl 50 to uncover the best, the worst, and the most controversial ads according to Twitter users. Using advanced Sentiment Analysis techniques, we were able to uncover that Amazon’s star-studded effort was the most popular ad at Super Bowl 50, earning the highest volume of positive tweets. PayPal, on the other hand, found themselves at the opposite end of the positivity scale, receiving the highest volume of negative tweets. And the most controversial? We had a clear winner in that category with Mountain Dew’s Puppy Monkey Baby shocking, confusing and amusing viewers in equal measure! With close to 30 million YouTube hits, it’s safe to say that Mountain Dew did pretty well from their wacky creation last year! For PayPal on the other hand, it was back to the drawing board with an expensive disappointment. Note: In this post, which is part 1 of a 3 part series, we’re going to focus on the hype surrounding the ads battle in the lead up to big game. Check back for part 2 and 3 where we’ll dive into the in-game reaction on social media and how the brands fared from the press reaction after the event. This year, as well as once again analyzing millions of tweets to uncover the good, the bad and the ugly among Super Bowl 51 commercials (check back next week for that one! ), we thought it would be cool to find out which brands are receiving the most media attention in the lead up to the event. Using the AYLIEN News API we sourced and analyzed thousands of news stories that mentioned keywords relating to the Super Bowl and the brands that are advertising throughout. From these stories, and using the power of Natural Language Processing in our Text Analysis engine, we were able to uncover which brands have been mentioned most in news stories in the lead up to the event.. Right away we can see a clear leader in Budweiser, who received 50% more mentions than the second most mentioned brand, Pepsi. Why are Budweiser receiving so much attention? Well, much like Mountain Dew last year, controversy is proving to be a key factor, as we’re about to show you. Want to track mentions and get intelligent, NLP-driven insights into the world’s news content? 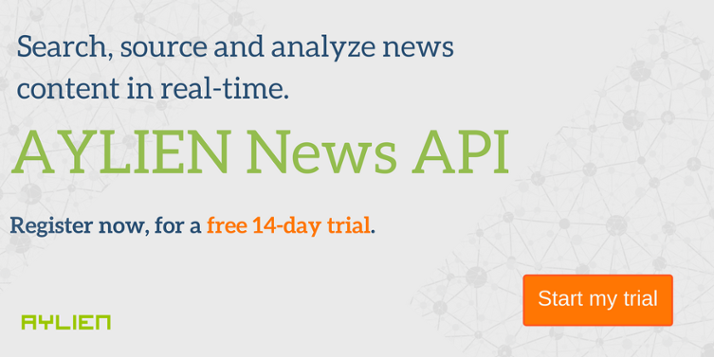 Sign-up for a free 14 day trial of our News API and get started! Having uncovered the top 15 most mentioned brands, we thought we would put our necks on the line by selecting three of these brands that we believe will make the biggest splash on social media during Super Bowl 51. Budweiser’s commercial preview, titled Born The Hard Way, shows Adolphus Busch, the co-founder of Anheuser-Busch, arriving in the US from Germany with the dream of opening his beer brewery. With the immigrant-theme of the commercial and opening line of dialogue being “You don’t look like you’re from around here”, the thoughts of political statement quickly spring to mind. Despite Budweiser vice-president, Ricardo Marques, stating that “There’s really no correlation with anything else that’s happening in the country”, news outlets and social media commentators beg to differ, with a strong split in opinion quickly forming. We’re even seeing the spread of #BoycottBudweiser across many tweets. @Budweiser needs to stay out of politics. Don't you realize your customers mostly voted Trump? #boycottbudweiser. Whether intentional or not, Budweiser have placed themselves firmly at the center of an fiery debate on immigration, and it will be fascinating to see the public reaction to their main showpiece on Sunday. Snickers will make Super Bowl history this year by being the first brand to perform and broadcast their commercial live during the event. While Snickers have released a number of small teaser-style previews with a western-theme, we’re still not sure exactly how this one is going to play out. With the intrigue of a live performance, as well as the inclusion of superstars like Betty White and Adam Driver, we’re excited to see how this one goes, particularly the reaction on social media. The world’s first live Super Bowl commercial presents us with the opportunity to track public reaction before, during and after the performance. While we’ll be tracking and analyzing the reaction to all of our top 15 ads, the uniqueness of Snickers’ live commercial brings a whole new level of insight into the tracking of public opinion. Judging by the teasers, it appears that Snickers are going for a wild west-style performance with horses, celebrities and a number of performers. The big question is, how will social media respond to a real-time, potentially unpolished and unpredictable live performance? We can’t wait to find out! Live format will inspire and drive high social engagement. A popular cast, inclusion of horses and a fun theme will see Snickers near the top of our most liked ads in terms of positive Twitter sentiment. Our second most mentioned brand, Pepsi are investing heavily in Super Bowl 51 with commercials for two products, as well as sponsoring the 12-minute Halftime Show. For Pepsi, their main aim is to generate awareness around two new products; LIFEWTR and Pepsi Zero Sugar. Have they been successful in this regard so far? While our post-game analysis will give us a better indication of the overall success of their campaign, we can perhaps already say that these two products are being somewhat overshadowed. Here are the top keywords from stories mentioning “Super Bowl” and “Pepsi”, excluding game-related and obvious brand-related keywords such as Houston, PepsiCo, football, etc. If you weren’t aware of who was performing during the Super Bowl Halftime Show, now you are! Lady Gaga is absolutely dominating in terms of media mentions, and Pepsi’s high mention volume is most definitely a result of the singer’s involvement in the Halftime Show that they just happen to be sponsoring. Perhaps worryingly for Pepsi, we saw no mention of LIFEWTR or Pepsi Zero Sugar in our top 100 keyword results. Last year, PayPal were accused of playing it safe when it came to their Super Bowl ad. Have Pepsi made the same mistake with LIFEWTR? Huge Twitter mention volumes for Pepsi, owing to Lady Gaga’s performance. Low mention volumes for LIFEWTR and Pepsi Zero Sugar. Tame public reaction to LIFEWTR commercial and very low YouTube views. Who will be the winners and losers at Super Bowl 51? We’ll be listening to and analyzing news and social media content before, during and after Super Bowl 51 to bring you our annual insights into public and media reaction to both the game itself and the ads battle, so check back next week to find out who were the biggest winners and losers!